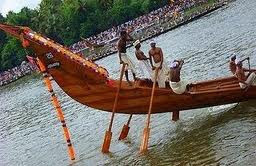 Aranmula Vallamkali Boat Race Festival will Celebrate on 02 Sapetember 2013 at River Pamba, Aranmula in Pathanamthitta district in Kerala. 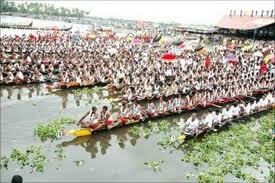 Aranmula Vallamkali is an annual water sports meet especially for boat races held in Aranmula district Kerela. The water fiesta is organized during Onam in the month of September. This world famous fiesta owes its origin to the Sree Parthasarathy Temple situated on the banks of the Pamba River. 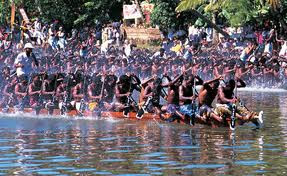 Vallamkali refers to the boat race competition that is held during the last two days of the festival. 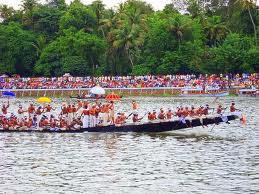 The participants, who are trained to row these boats, compete not merely for winning the competition but to celebrate theanniversary of the Sri Krishna idol installation, the main diety at the Aranmula Parthasarathy temple. As according to history Lord Krishna crossed river Pamba, the race is conducted in the Pamba River in front of the temple to commemorate the crossing of the river by Lord Krishna. This annual event attracts tourists from all over the world. 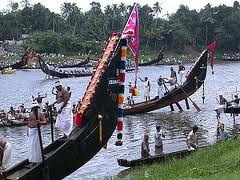 The snake boats that participate in this colorful carnival are called Palliyodams. The structure of these boats resemble snakes and are about 100 feet in length, with its front tapering, hood raised and the rear portion towering to a height of about 20 ft. Duringthe races, about 39 to 41 of such boats participate in the event each accommodating about 120 people including oarsmen, singers and helmsmen. Colorful flags are fixed at the head of the boat and the colorfulparasols at the center make it a spectacular show of pageantry too. Apart from the famous boat races, other rituals include offering prayers to Lord Krishna early in the morning on the day of the boat race. At this time all boats assemble near the temple to seek blessings of Lord. After the morning prayers and other rituals, the race starts from the afternoon, with groups of men and singers all shouting and singing in a rhythmic manner. 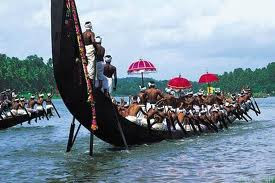 A series of songs called “Vanchipattu” are sung throughout the races, while group of men row up and down the River. Decorated silk banners and golden umbrellas are carries along with the participants that provide a mystical environment to the festival of Aranmula Vallamkali. Palliyoda Seva Sangam is the main organizer behind the annual water festival. 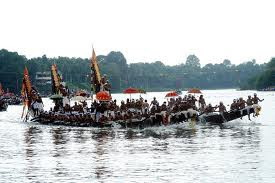 Over the years even the Central Tourism Ministry has been providing financial assistance for preserving and promoting this legendary snake boat race, believed to be in existence for the past 1,000 years. 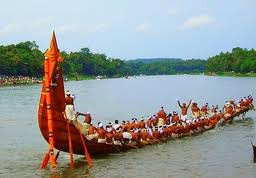 Traditionally, it is commanded by a Kaarnavan / Karanaadhan (Village leader) with First Adanayampu and under him there will be 3 main oarsmen who control the movement of the boat along with 12 feet long main rudder-oar (Adanayampu). Sitting two in row along the length of the Boat there will be the oarsmen, they row in rhythm of the vanchipattu (boatman's song). Standing on the platform in the middle of the boat, the main singer will lead the vanchipattu. A few singers will be with the main leader while others will stand at the middle between the oarsmen. Nearest railway station: Chengannur, about 10 km away. Nearest airport: Thiruvananthapuram International Airport, about 117 km away.